Amidst the madness of Melbourne’s International Comedy Festival theatre goers are spoilt for choice. But if comedy is becoming all consuming then there is a production that is well worth the effort to step outside of the comedy circuit. Almost fifty years ago Anthony Burgess’ A Clockwork Orange announced to the world an unapologetic examination of turbulent adolescence. Kubrick’s 1971 film, similarly brought forth an apocalyptic aesthetic to explore the heights and depths to which our instincts can both soar and plummet; and this year we have once again a startlingly powerful new addition to the repertoire. 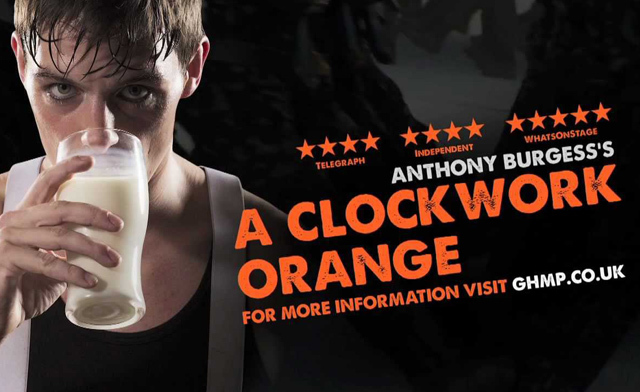 Brought to Australia by Les Currie and Glynis Henderson Productions, A Clockwork Orange is the latest work from Action to the Word theatre company, a sizzling example of brilliant theatre and mesmerizing performances. An all male cast is led by the charismatic Martin McCreadie who catapults the audience into the world ofAlex DeLarge and his droogs, hell bent on fuelling their anger and frustration through a spree of senseless violence. The unequivocal display of seething aggression is electrifying, especially when coupled with a minimal set, loud and belligerent music. The air is heavy with obscenities, the floor littered with the remains of savage assaults, old women are battered and there seems to be no stopping the fury of these testosterone driven youths. But everything changes when Alex having been arrested and in prison for two years becomes the first recipient of a brand new treatment – to eliminate the criminal instinct. Would our society really be a better place if we were forced to be good? Is it better to choose to be bad? The questions are hauntingly relevant today in a world where seemingly unprovoked attacks of violence (both literal and otherwise) still continue to erupt. The production is slick and Spencer-Jones’ attention to detail, especially with respect to the choreography, is an absolute delight. Every movement is sharp and has impetus. There is not an ounce of excess fat in the production and the cast manage to successfully keep the energy taut at all times. The costume and set design is also visually striking with orange being the only colour to pierce the stark black-and-white aesthetic. The music, an eclectic mix from the 1960s onwards marshals the action with its powerful tempos, though a few of the song choices may have been somewhat misplaced. Along with McCreadie standout performances were delivered by James Meryk, Philip Honeywell and Stephen Spencer who all played a number of different characters with dexterity and skill – as well as being members of the ensemble. For those who haven’t read the book or watched the film this vibrant adaptation of a classic text is must-see. For those who are familiar either with the text, film or previous stage productions then this will be a night to remember. Revisit a confronting portrayal of human nature in all its gross excesses and walk away having seen theatre that does not merely provide meaning, but provokes it.